The Common Core State Standards Initiative outlines core math and language arts content to be addressed at each grade level. That is, the Core Standards carefully delineate what is to be taught at each grade level, at least in those subject areas. But they do not address the ways that content is to be taught. In fact, when listing “What is Not Covered by the Standards,” the first sentence states, “The Standards define what all students are expected to know and be able to do, not how teachers should teach.” It is important to understand what the Standards do and do not mandate, and then look for ways to integrate both creative teaching, and teaching for creativity, into the mix. For example, imagine that you are teaching 4th grade and you want to incorporate creative thinking strategies into your instruction. Imagine you are working on this standard. Your goal for today is to help students describe a character. You could have students read a paragraph and pull out the descriptive words and phrases—but what other options might allow for more creative thinking, and be more interesting for students? 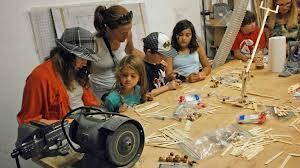 Start by asking yourself some basic questions about divergent/creative thinking strategies. These questions could trigger a number of ideas. Let’s take Alice, since Alice in Wonderland is one of the suggested texts for fourth grade. I could pick a pivotal scene and ask students to generate many possible choices the character could make. Then they need to choose which choice the character is most likely to make, supporting their choice with evidence about the character’s personality, beliefs, etc. For example, early in the story Alice is stuck in a room, too big to get through the door, and she sat down and began to cry. What could she do next? Which choice is more likely, based on what we know about Alice? I could ask students to describe a character, then ask them to describe the same character again, but from the perspective of another character. For example, how might the Cheshire cat describe Alice? Or Duchess? They must provide evidence for why the second character is likely to hold those views. There are lots of possible “what if” questions in Alice in Wonderland, but it is a bit trickier to come up with a “what if” question that will help students better be able to describe Alice’s characteristics. I might save “what if” for another day. Make connections between the text of a story or drama and a visual or oral presentation of the text, identifying where each version reflects specific descriptions and directions in the text. It would be interesting to have students compare the details in the text with the original illustrations. Are there details they’d like to add to the illustrations to make them better match the text? Metaphors for Alice could be fun! If Alice were an animal, what animal would she be? What about Alice is like that animal? How could students investigate Alice? 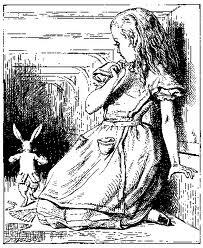 Perhaps at the beginning of the book students could generate hypotheses about Alice’s characteristics. Is she curious? Brave? Not very careful? As they continue to read, they could chart evidence to support or not support their hypotheses. Any of these activities help students look at details and describe a character, but they also provide opportunities for flexible thinking and imagination. Of course there are a scores of other creative activities possible with Alice, but the basic questions listed above can help give direction to almost any subject and standard. Remember, the goal of the standard is set, but as Alice found out, even if you know where you are going, there are a lot of ways to get there, not to mention adventures along the way!